Production: Direct from customer SAT file. 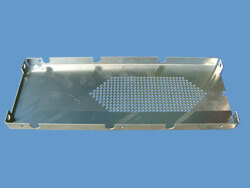 CNC punched with fine perforation and formed. This is part of aircraft kit. Point to note is that these are manufactured at 45 degrees on material natural grain direction to increase structural strength integrity of final produced part.